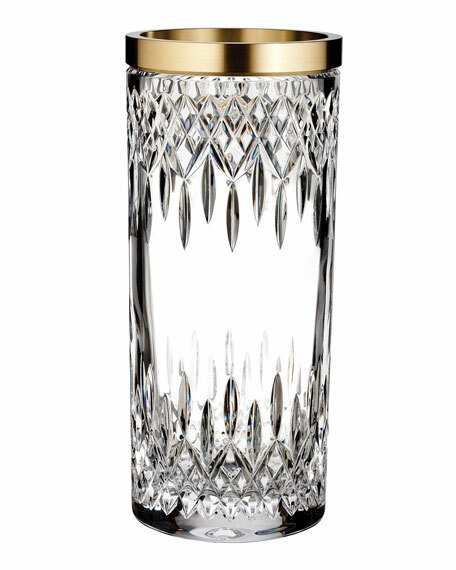 Waterford Crystal Lismore Reflections Gold Band Vase, 12"
Waterford CrystalLismore Reflections Gold Band Vase, 12"
A modern take on the beloved classic, Waterford's Lismore Reflection with Gold Band collection features a mirror image of the iconic Lismore design rendered at the bottom and top creating a new "reflection" treatment. Stylish matte gold banding combines with modern cylinder shapes and beautiful cut crystal. The Lismore Reflection with Gold Band 12" Vase is beautiful with flowers or a pillar candle making a perfect gift in Waterford packaging. Gold plated brass band at lip.